The European satellite communications market is most certainly alive and well... The research analysis firm, Futron, finds a 77 billion euros market worldwide, with satellite services generating some 38 billion euros of this global revenue. Europe is a dominant force in the satcom marketplace and as Futron estimates, the European space industry can claim approximately 40 percent of the world market in the trinity of satellite environs: manufacture, launch, and operation. In addition, just in case you were unaware, three of the five largest satellite system operators in the world are European based. European satellite services without the need for numerous approvals  thats the aim of the European Union (EU) and their latest decision to provide satellite operators with a single authorization to offer their technologies to customers. The Executive Commission of the EU believes creating a single permission process will create services that can extend to the most remote areas, as well as assist in ensuring the viability of such services, which would include high-speed data and mobile TV throughout Europe. The U.S. market demand for satellite capacity might be growing modestly. The Asia-Pacific region, with China and India experiencing progress, might also be seeing some cause for DTH optimism. But it is Europe that is the worlds powerhouse for satellite growth and optimism. Back on February 19, 2007, the Boards of XM Radio and Sirius Satellite Radio approved a plan of merger and began what would become a long, combative and historic regulatory drama. On March 29, 2007, they submitted an application with the FCC to combine their spectrum into a new merged entity. On June 8, 2007 (the FCCs Day 0), the pleading cycle was officially established. On Friday, July 25, 2008 (FCC Day 412), the approval was finally granted. Today, Zee Entertainment Enterprises is a multi-faceted media company with DTH and Broadcasting operations that encompass the world. Zee reaches an estimated 200 million viewers in more than 120 countries. From its origins in 1992 as Zee TV broadcasting based in Singapore, Zee is now at the forefront of broadcast satellite applications in South Asia. NSR remains positive that the European two-way satellite broadband players are on the right track, even if the main players might be taking somewhat different approaches. There is more than one road that leads to Rome, after all. The satellite industry might soon be approaching a new era  one in which satellite and cellular networks are combined and consumers are able to use both networks on handsets similar in size to what is currently on the market. Businesses and individuals attending IBC continue to grow each year in number. This is amazing, given the ever increasing cost for such attendance. Proof that something worthwhile is always worth the expense. This year, IBC will be open for business beginning at 12:00 noon on Friday, September 12th. SATCON is part of the trilogy of events that now comprise Content & Communications World, the others being HD World Conference & Exposition and the IPMedia Expo. The entire component brings attendees coverage of content creation, management, post-production, delivery, infrastructure, and a wide range of communications solutions, from satellite to fiber to hybrid networks, IP, mobile communications and more. This PPM Ltd. case study describes the application of RF over fiber technology to overcome problems of transporting GPS, Galileo and Glonass signals through tunnel networks. INTOREL has integrated many M&C systems for SES-ASTRA, one of the worlds largest satellite groups. As the SESs network of satellites grows, INTOREL provides the monitoring and control systems for their installations that are used for transmitting large amounts of data or multimedia from point-to-point or among multiple sites. Many of todays satellite Network Operations Centers (NOC) are assembled from a variety of systems and products designed to simplify day-to-day communications management and transponder planning operations. John Pittas provides guidance for Fujitsus MPEG-4 AVC codec products to FCPAs New Products Group. Codecs are critical to the success of broadcasting and to any companys bottom line, which is why Johns strategic technology and business development planning for TV broadcast products being brought to Fujitsus Strategic Planning Office stream is so important. He joined FCPA in 2006 and has been instrumental in introducing the companys MPEG-4 AVC HD Codecs into the U.S. broadcast market. He possesses more than 30 years of experience in film and video production, video circuit and system design, and broadcast product and engineering management. Satellite broadcasting continues to gain momentum, especially with Digital Video Broadcasting  Satellite  Second Generation technologies, otherwise known as DVB-S2. With the increasing demand for High Definition (HD) programming, more and more service providers and broadcasters are stepping up their infrastructure in order to provide the coveted services. Arqiva is one such company. SatMagazine talked with Arqiva Satellite Media Solutions Senior Vice President Simon Thrush to discuss recent developments on the HD front. 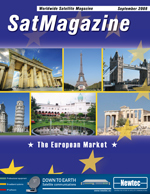 With this issues theme revolving around the European market segment, speaking with subject matter experts seemed a most logical route for imparting information to our readers. One such subject matter expert who deals with the European Maritime world is David Harrower of iDirectwe managed to ask him a few questions regarding this growing environment. The FSS business model is predicated on a satellite operator who makes a sunk investment in rather expensive space hardware that can perform its service for a specified (but limited) period of time. In the abstract, the spacecraft could perform any function as long as the operator receives revenues that effectively liquidate this investment over the lifetime. The FSS model depends on revenue from selling satellite capacity in the form of transponder bandwidth and power to a market composed of commercial and government users. Convergence is no longer a trend, but a reality. This convergence of the computing, telecommunications, and audiovisual industries has, simultaneously, impacted on both the demand side and the supply-side development of the satellite communications industry. Service providers, equipment vendors and end-users are directly affected by the changes in network topology, product development and company business strategy. The consequences of these changes have been so profound that I doubt they were anticipated when convergence was first conceived. In the early 1960s, both medium and synchronous altitude communication satellites were of interest to planners. NASA conducted experiments at both altitudes using the Relay and Syncom satellites. Considering the successful development and increasing maturity of Sirius Satellite Radio and XM Satellite Radio in the U.S., the timing could not be better than right now to introduce satellite radio to Europe. The two companies (now a single entity, thanks to their recent merger) reported a combined USD 2.4B in revenue last year and have, between them, generated a total of nearly USD 6B since services started six years ago.